Some days it seems like anything that catches my eye is a potentially viable subject. 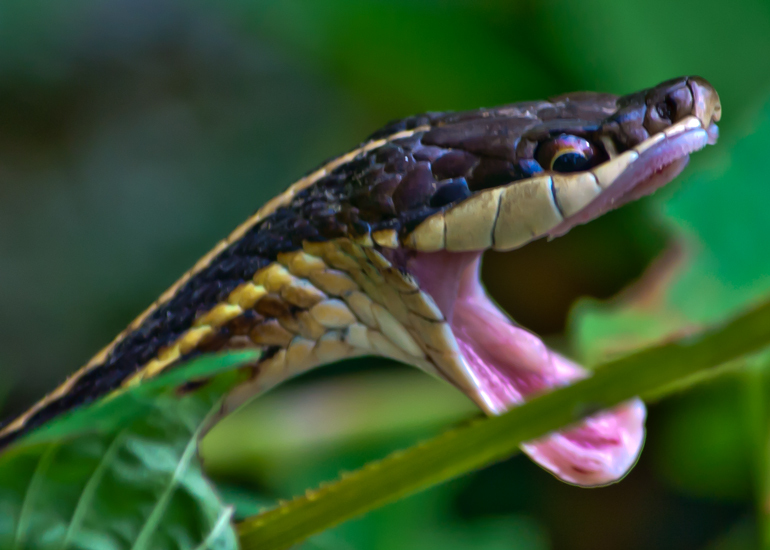 This was the case last Friday when I was walking in a marsh in a local park and came upon this snake. Much of his body was concealed, but the upper body was exposed enough for me to attempt a head-and-shoulders portrait. Oh, wait a minute, I guess a snake does not really have shoulders, so I guess I was attempting a head-and-neck portrait. The snake was beautiful in his own way, with wonderfully textured skin and stunning gold accents around his eyes. I thought he was probably a garter snake, but after a bit of research I am now convinced he is an Eastern Ribbon snake (Thamnophis sauritus), not a Common Garter snake (Thamnophis sirtalis). 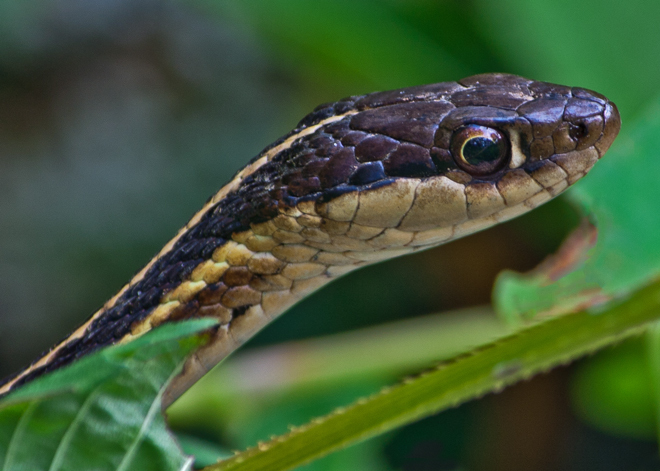 If you are at all interested in the differences, there is a wonderful article entitled “Telling Garter Snakes and Ribbon Snakes Apart” at http://www.gartersnake.info (yes, that’s the actual web address). As I was admiring his beauty, he may have decided to remind me that he is a predator as suddenly he opened his mouth wide, really wide. I was looking through the lens at him and the effect was magnified because his head filled a good portion of the frame of the viewfinder. My first thought was that he was sizing me up as a potential snack. I had the presence of mind to snap a picture before his mouth snapped shut. A vine covers part of his mouth in the photo, but I decided to include it to show you how wide his mouth really is. Now I understand how he is able to do things like swallow frogs whole. I’m glad I’m a lot bigger than a frog. This past weekend seems to have been my heron weekend. I posted some photos of a great blue heron that I saw on Saturday. However, I realize that hadn’t yet gone through all of my photos from Friday, which included this shot of a green heron perched on the dead limb of a tree. The tree was overlooking a muddy pond and I couldn’t tell if the green heron was just resting or whether he was preparing to hunt for prey. 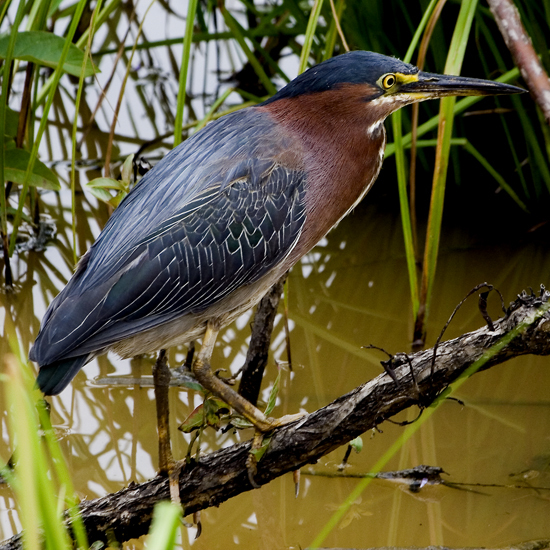 The situation afforded me an unobstructed view of the green heron and I quickly started taking some shots, suspecting (as turned out to be the case) that my luck would not hold for long. 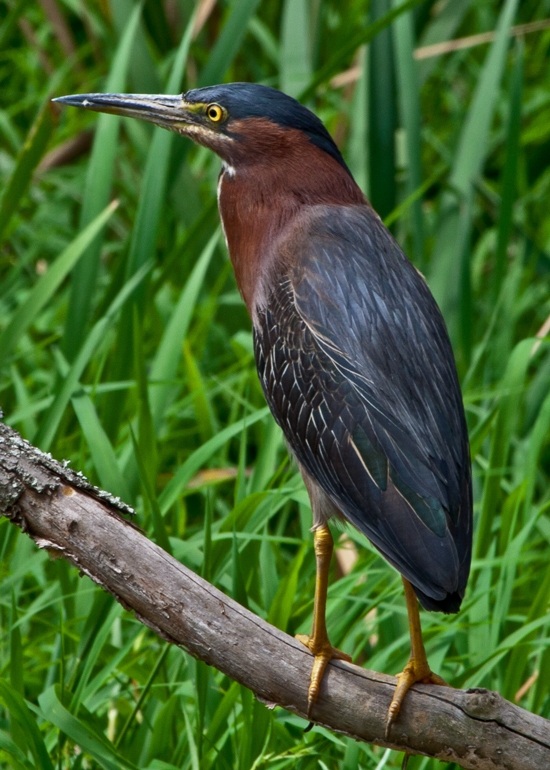 The green heron soon jumped from his perch and moved farther away into some undergrowth when he focused his attention on the water. I was totally fascinated and watched him from a distance for quite a while. Several times he “alerted” by extending his neck and leaning toward the water, but I didn’t managed to see him catch anything. 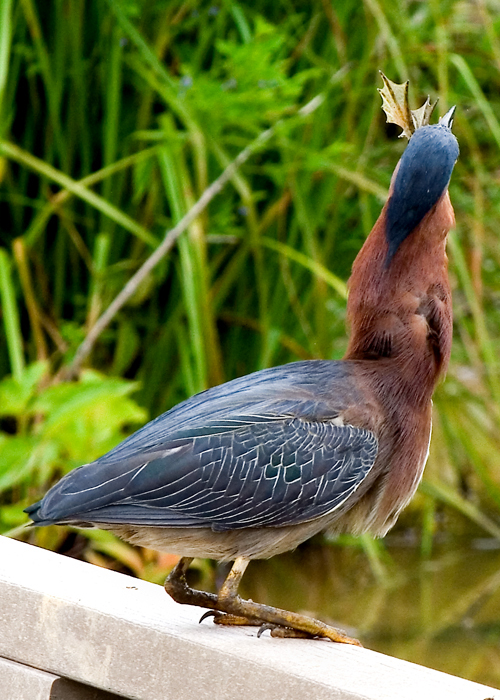 This image captures some of of the green heron’s gorgeous colors. I especially like the chestnut color around his neck and the intensity of the yellow of his eyes. 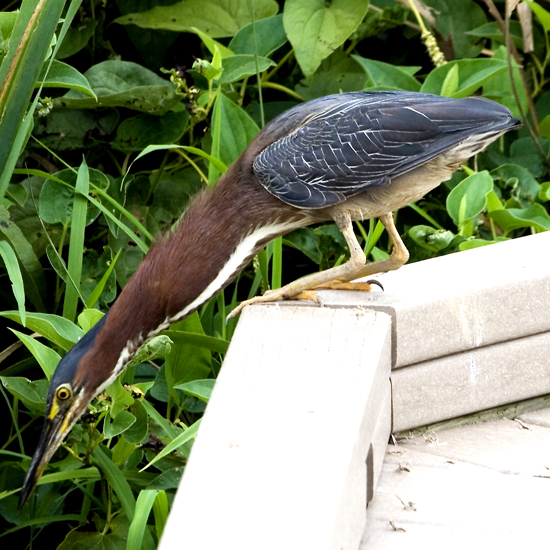 Yesterday’s blog entry featured the adventures of a young green heron catching and swallowing a frog. 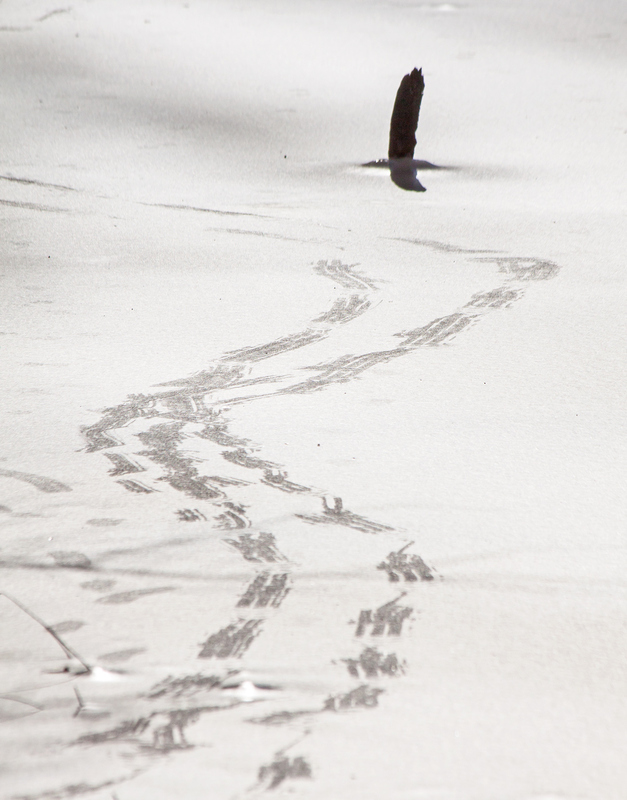 After the snack was consumed, though, the heron moved from the boardwalk into the marshy area. There he perched on a branch and seemed to pose for me, maybe figuring that his exploits were worthy of a magazine feature. The resulting photograph is one of my favorite shots of the whole day, because I think it captures well the rugged beauty of this young bird. The background is a little distracting but I like the reflections in the water and the angle of the ranch. I decided to include two additional action shots from yesterday. The photos seem to show that I probably was incorrect when I stated that the heron had speared the frog when he initially caught it. 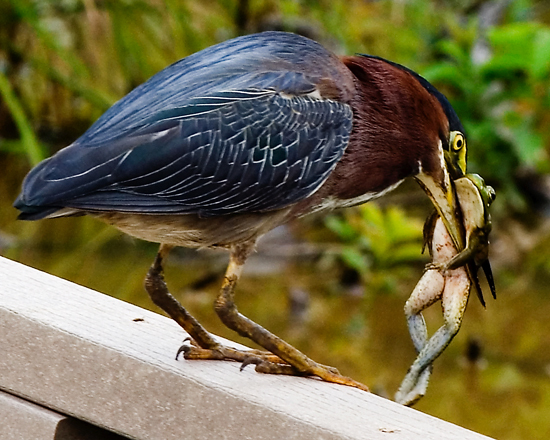 It looks like the heron was merely holding the frog with his beak as he adjusted its position. Now that I think about it, the process of swallowing the frog would have been complicated if the frog had been speared. 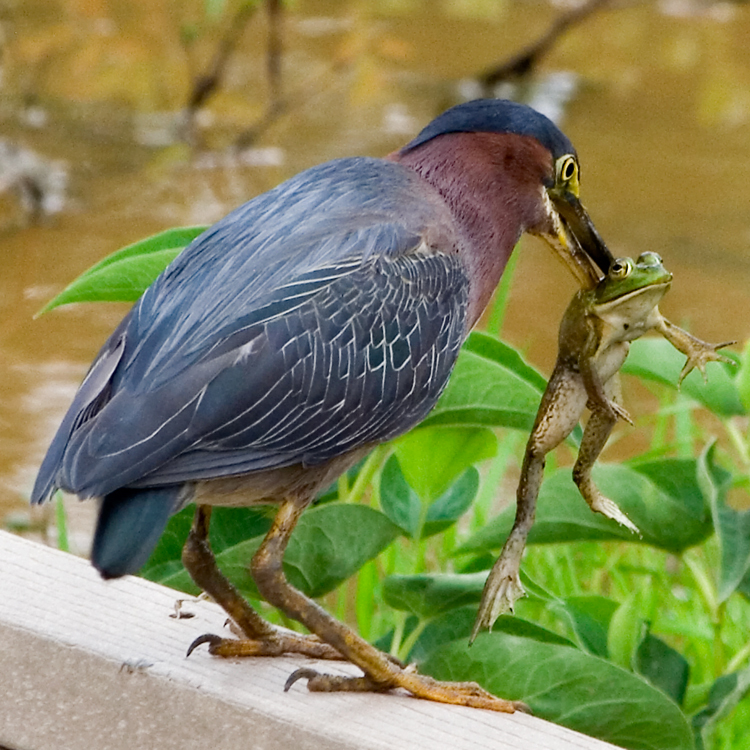 One can only imagine what is going through the frog’s mind as he looks into the crazed eyes of the green heron who has just speared him. 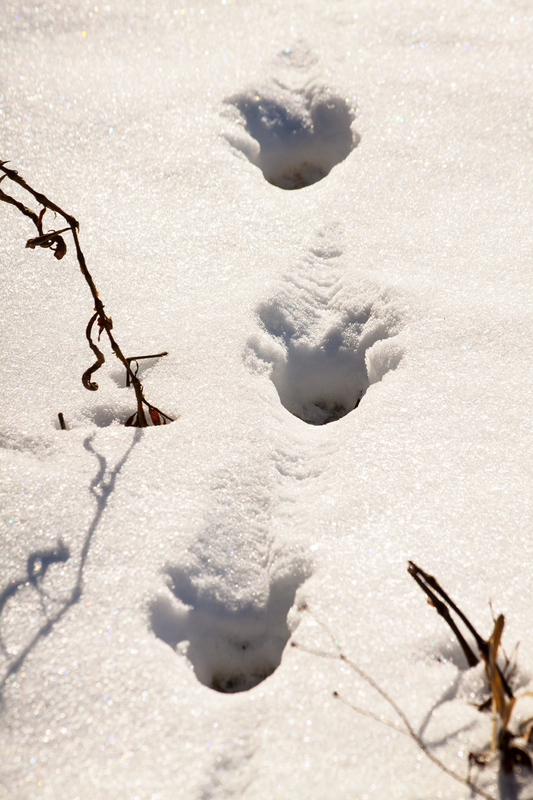 Is he looking for mercy? 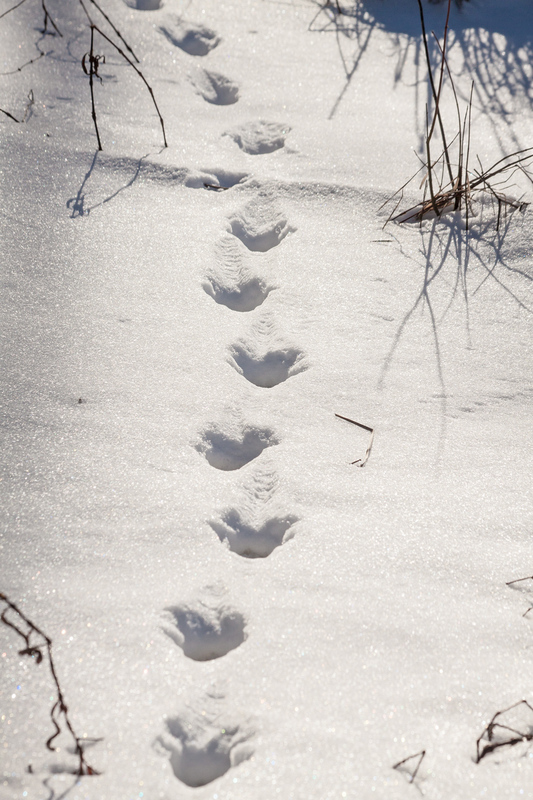 Is he resigned to his fate? I watched the prelude to this moment unfold this afternoon at Huntley Meadows Park, a marshland park here in Virginia. 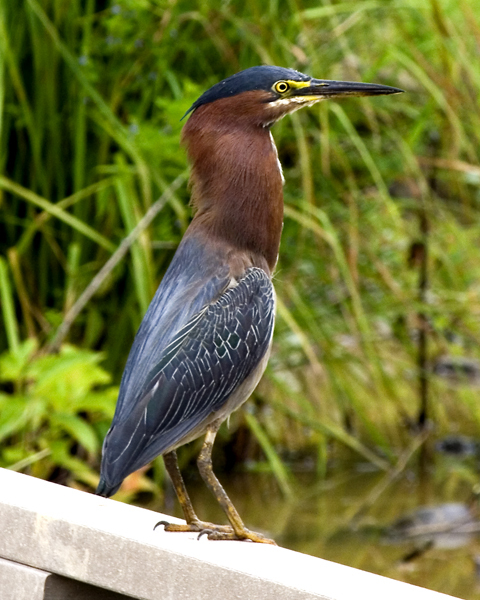 The green heron was intently scanning the water from the edge of a boardwalk that runs through the march. Periodically he would extend his neck down toward the water. Several times we heard an excited “eeep” sound followed by a splash, indicating another frog had escaped. After a few more minutes, however, the heron dived into the water and reappeared on the boardwalk with the speared frog you see in the first photo. 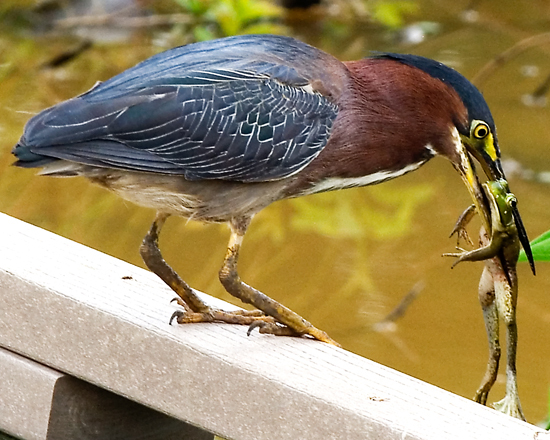 When you look at the comparative size of the heron’s mouth and the frog, it hardly seems possible that the green heron could swallow the entire frog. The heron took his time shifting the position of the frog and then all at once he turned his head, bent his neck back a little, and down went the frog. It happened so quickly that I was able to snap only a single photo that shows the frog’s webbed feet as the only remaining parts that have not yet been swallowed. In this final photo the heron no longer has a slim neck. I have no idea how long it will take for the frog to reach the heron’s stomach but I am pretty sure he was not yet there when I took this photo. And don’t try to talk with the heron during this period. Why not? Read the caption of the last photo! I can’t talk now. I have a frog in my throat.